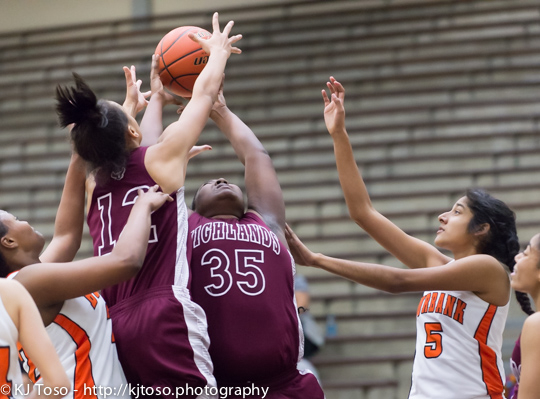 Highlands' Erin Caldera (12) and Alex Darden (35) try to track down a rebound against Burbank. The Bulldogs' Savannah Cassiano (5) looks for an opening. AREA TEAMS INCLUDED: Edison, Harlandale, Highlands, Lanier. Kiara Pesina is the link between two of Highlands’ best seasons. The Owls’ sophomore point guard is helping lead this year’s team to what could be the school’s second undefeated district season. Her aunt, Rosalinda Mojica, played for Highlands when it won the first unblemished title in 1981-82. Although Highlands wasn’t perfect during its 1982-83 district schedule, the Owls came within a win of qualifying for the state finals. Mojica missed an overtime free throw that would have helped send them to state. Lanier (18-12, 10-4) at the Alamo Convocation Center. Fourth-place Harlandale (15-15, 9-5), which had a four-game winning streak, was within 10-5 when junior guard Justyne Perez (14 points) nailed a three-point shot. The district leader reeled off 19 unanswered points. Highlands forced five turnovers in the quarter. “We’ve been playing well,” Harlandale coach Jackie Contreras said, “but they’re a tough team. If you make some mistakes, they’re going to feed off them. We dug ourselves a hole we couldn’t get out of. Highlands junior Aaliyah Prince scored 17 points but was held scoreless by the Indians in the second half as the Indians concentrated their defense on stopping her. That’s where Pesina came in. The sophomore scored seven of her team’s 19 points in the third quarter. “We saw that they went to a box-and-one (defense) to stop Aaliyah,” Pesina said. “On this team, everybody’s going to get theirs. It doesn’t matter if it’s this game or the next game. Analissa Hernandez scored seven points for Harlandale. Highlands’ win against third-place Lanier left the Owls three wins from completing a sweep of District 28-5A competition. Highlands led 46-27 going into the final quarter. Lanier’s 12-point margin equaled the closest a district opponent has come to the Owls. The Owl’s Alexis Darden scored 12 points and Prince had nine. Lanier received 16 points from Ruby Garza and 13 from Sabrina Cortinas. Harlandale got a scare at Edison (7-22, 2-11) Jan. 30, but survived for a 38-36 win. Kayla Nunez and Christi Ricondo led the Indians with seven points. Freshman Judilynn Mayorga led Edison with 14 points and 10 rebounds. Amy Marcos finished with nine points and nine rebounds. Harlandale recorded a key 51-38 win over fifth-place Brackenridge (12-19, 7-6) in its previous contest. The Eagles had won the first meeting 66-49 Dec. 16. The victory enabled the Indians to pass Brackenridge in the district standings and hold the final playoff spot with three games remaining. “We’re a different team than we were in the first round,” Contreras said. “The girls know what they need to do and who they need to stop to get a win. We’re playing our game and peaking at the right time.